In an attempt to broaden our reach and help as many people as we possibly could. 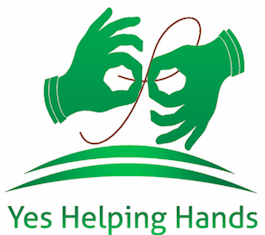 Helping Hands Handicrafts, which first started by providing training to deaf and blind to make them economically and emotionally independent was able to extend helping hands to people with all kinds of disabilities as well as trafficked girls/women and all the people who are less loved by our society. It all works in a cycle. First, we recruit these people and provide skill training to them whilst also providing them with food to eat and a roof to stay under. Then, we sell the products handmade by them and distribute the profits. What remains is again used to help other people who need help. Little by little, Helping Hands has been able to donate to 3 schools which precisely run through this donations, rebuild 672 homes destructed by the earthquake and have helped change 180 lives until now. We are well recognized for our fair trade and bring our fiber from Ladak, Tibet, and Nepal; all of which is also an effort to make women economically powerful. ‘ Dirty hands and damaged lives make beautiful products. Help us widen our reach, shop with us today or give us your ideas, suggestions, cash or anything you possibly can to help us extend our hands to help more people. Join us, Get involved today!